Whether it’s baking, doing marvellous challenges or getting your work place on-board, your support for Vintage Vibes makes a huge difference to lonely people in Edinburgh. We’ve had a bit of a think on your behalf! It’s fantastic that you would like to help us tackle loneliness in Edinburgh for good. Find your inner adventurer… run a race, participate in an obstacle course, climb a mountain or set sail! Download our Ideas Pack for more suggestions and nifty tips on how to make the most out of your ideas. If you’re thinking about fundraising for us then get in touch. We can’t wait to hear from you! Could your workplace save the day? 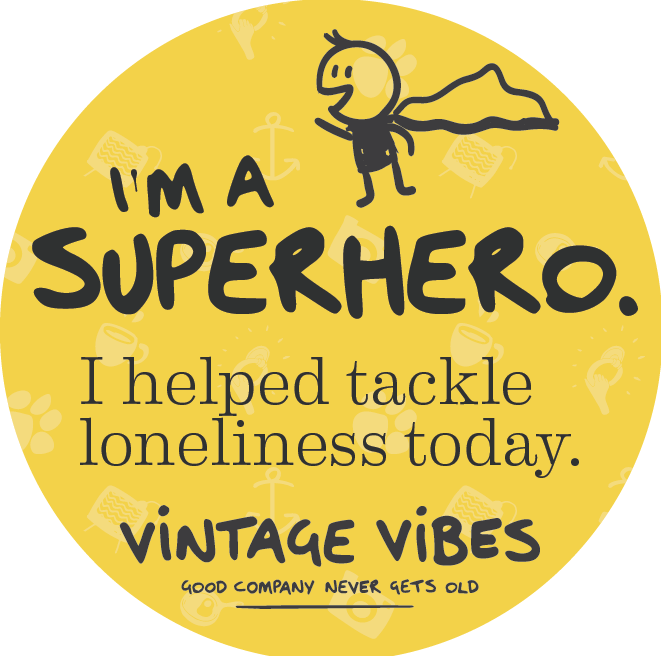 Vintage Vibes is all about friendships and good company whilst tackling loneliness – and we love to partner with lovely businesses! By nominating Vintage Vibes as a chosen charity project, you will be making a positive impact in your local community and changing the to the lives of the loneliest over-60s population in the UK. Being our friends not only improves lives but also boosts the positive PR of the business, opens the door to our networks of fabulous staff, volunteers and VIPs, plus gives your workplace team and brand something really super to be proud of. Hurrah! Make us your charity project of the year! Buying or creating merchandise to benefit Vintage Vibes – reusable bags, Christmas cards, mugs and more! Get in touch if you are interested in being a production partner for our soon to be launched range of merchandise. Over 80% of our survey respondents said they would be keen to support a local business that was supporting Vintage Vibes. Get in touch at hello@vintagevibes.org.uk or call 0131 343 0958 to find out more. Want to donate today? Click here.